It was recently reported in the Orange County Register that the Orange County Sheriff has not been reporting all the crimes to the FBI. 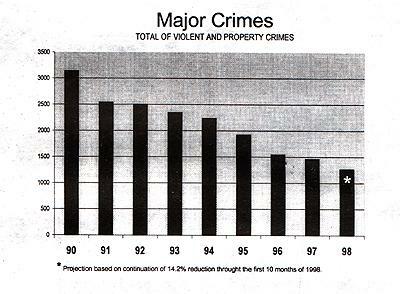 This has made our real crime rate appear much lower than originally thought. This has unfortunately helped many to benefit from this like our current council members. Without a 'crime fighting' plan they have been taking as much credit as possible for many years for the reduction in crime. Our current council members should be embarrassed to run for re-election after the horrible job they have done for our city. Q: Does the revenue from the Stanton Utility Tax directly effect the crime rate in the city of Stanton? A: No. We were paying the Utility Tax for half a decade when Dana Parson's reported in 1998 that Stanton was number 1 in crime in the county. The crime rate may be down but no information sent out by city hall has shown that their efforts have done anything to reduce crime. Some would say the unemployment rate has more to do with the reduction in crime than any other factor. Notice the similarity of Stanton's crime graph and the Bureau of Labor Statistics' unemployment graph. And now that unemployment is increasing so is the crime rate.